I wish I didn’t have to depend on subtitles…sigh….The boy is so well informed, so astute in his critical thinking…it boggles the mind that such eloquence can come in so small a package. What do you think? Are we at risk of becoming a commodity owned by one person? Do we listen to our 12 year olds? Do we foster a 12 yr old to think about anything except consuming? Are we wasting our most precious natural resource, our youthful minds, by encouraging obedience, status seeking, fanciful escapism in war games and Disney movies? Are we protecting our children from harsh realities or are we taming the slaves? The Parliament Building in Victoria, B.C. was the scene of a thwarted terrorist plot on Canada Day 2013. Amanda Korody and John Nuttall were the accussed. Christy Clark strode down the exterior steps of the Parliament Building to engage in rhetoric with news reporters. Her remarks were scripted and full of righteous indignity. Who is the “They” in Christy’s remarks? “They want us to view each other with suspicion. They want us to be seized with anger. They want this because they hate the things that make us Canadian. They hate the values that make B.C. and Canada the envy of the world.” I’m only scared of you, Christy Clark, and your handlers. These two people WERE Canadians. Is anyone who doesn’t like the values, ie: pipelines and bitumen, GMO crops, oppressed First Nations, corporate welfare, or anyone who doesn’t agree that those values are enviable; are all us disgruntled, dismayed, irate, citizens, grist for the “Find the Terrorist” mill? One has only to read the first responses and comments to a post in the Tyee,http://thetyee.ca/News/2013/07/02/Bomb-Plot-Leg/ to realize that I am not alone in my doubt, in my mistrust of those who wield power, in my awakening to the “spin” doctrine of the guardians of the 1%. It’s been a year. I’ve sold a few books. I’ve dabbled in self-promotion and found it a disheartening thing. I’m a writer, not a salesman. I had something to say and said it in a fiction, to soften it, to make it more appetizing, to be a waking up story after a long slumber full of unrealistic dreams. We cannot dominate the earth and survive. We cannot dominate other people and survive. We cannot keep taking from our Mother Earth. We cannot continue to put ourselves above all other living things. I am moving on, to talk more seriously. My thanks to Andy Everson for his artwork. 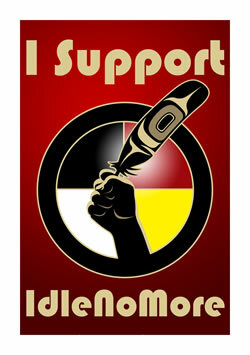 IDLE NO MORE is a grassroots movement in support of the People. It is for all of us. It has been raised into public attention by First Nation Peoples because it is a contradiction to our own settler socialized, racist views of the past. “Lazy Indians” will IDLE NO MORE. But they were never lazy, they were just ignored. It began in the hearts of four remarkable women- Nina Wilson, Sheelah Mclean, Sylvia McAdam and Jessica Gordon. These women regard changes to our legislation, the Omnibus bill etc., as an illegal and insulting misuse of power against other Nations. Our First Nations. The Nations that existed for thousands of years with a quality of life that was far superior to what we’ve accomplished in our four hundred year assault on this land, this Canada. We have thrown the planet into unbalance. We take from and dishonor Mother Earth. We think we’ve got it under control. We think we are thriving. But, we are waking up to find our lives are surrounded by illness, disease of the spirit, unjust resource sharing, corporate greed, political tyranny and corruption. Our systems of care are over burdened and shrinking, underfunded, while a few get rich and claim that their wealth will trickle down. But all that trickles down is the poisoned water, the tainted meat, the polluted air and, if we are lucky, a job; some task that undermines our spirits and feeds the monster that imprisons us. The IDLE NO MORE movement is for us all. It is a joyful gathering of humans that know we can stand against ruling powers that demean and belittle our laments. They are popping up in communities, small and large, and they speak to the need to respect our Mother Earth because she sustains us. McDonalds, Starbucks, Apple, Esso, Gap, Walmart, etc. don’t sustain us, they use the blessings of our planet and sell them back to us, as if we were not entitled, as humans walking upright on this planet, to what it offers for our survival. It is the dream we have been dreaming, of naming all things, dominating all things, believing we have created all things or at least, have been put in charge. We have become sleep walkers. You and I have earnestly done what we dreamed was rightful, but we are waking up and our First Nations brothers and sisters are here, at our sides, offering sustenance, a way of seeing the world that honors it, a way of being that is honorable and feeds our spirit. They, under International law, must be consulted before legislative changes are made that affect their ability to hunt and fish and live. They are never consulted. Now these legislative changes affect us too. We, the working people, the grassroots of our nations, are finding the ground cut from beneath us, our water polluted, our food tainted but we have no recourse. We got what we “democratically” voted for. It is not required that we be consulted. We gave them the power to decide. But the First Nations People did not. Well…book sales are pretty slow. I’m an abysmal self-promoter though I Tweet and Facebook. 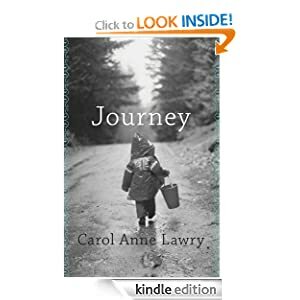 Both venues simply raised my awareness of other issues that are far more important than my little book, “Journey”. I’m grateful for that but feel my tweeting on political/environmental/human rights issues that are strongly polarized is not in the best interest of self promotion. Although, in fact, my novel circles these issues and my opinions on them are consistent. 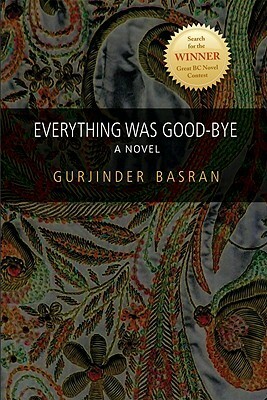 I’ve received awesome feedback on the novel and I love checking the status at Vancouver Island Regional Library. That one copy has traveled up and down the island and has consistently had 3 or 4 holds on it all last year. But books sales are dreary. Good thing I don’t depend on them. One would think, being such an avid reader myself and a frequent library user (I certainly can’t afford to buy every book I read) I would have noticed the lovely opportunities the library website gives for reviews and comments. Of course, now I have a book at the library, and it is being read, I keep expecting a review or something. I’ve never commented on the countless pleasures I’ve enjoyed reading favorite and new to me authors so it is rather ironic that I have such expectations of others. Take note: authors love being reviewed therefore I should review. I suppose money is a good review but my small royalty cheque, though pleasing, was not half as rewarding as a positive comment on Facebook. I’ve decided to write letters to my favorite authors – Louise Erdrich, Anne Tyler, Amy Tan, Jodi Picoult, Margaret Atwood and others – to express my delight with their words, the way they read my own psyche, my heart. Perhaps they remember when a nice review fed their creative spirit more than a small royalty. I encourage serious writers to join Scribophile. As a member for over 4 years, I’ve found the community to be invaluable in all respects. Membership is free, and although a Premium Membership provides widgets and whistles, the Free membership is perfectly adequate to get the feel of the community. In this user-friendly venue, writers encourage, critique and celebrate each others achievements and when a writer’s block raises its ugly head, there’s lots of forums to engage in that will soothe your angst and inspire you to move on. One can easily start a group to gather together in genres, goals, or any category that strikes your fancy and keeps you engaged with other writers in a well moderated safe-from-flaming space. Contests are a regular feature and provide the impetus to explore new areas or shine in familiar ones. I’ve posted, over the course of four years, 41 shorts – from flash, short stories and poems to query letters and two complete novels. Every page has borne the scrutiny of criticism that either changed my mind or entrenched my own voice, encouraging me to persist and improve my skills. Every piece posted costs you Karma (the on-site remuneration system) but is guaranteed 3 long critiques from others. Earning Karma is a lesson in itself. As you critique other’s work, you earn enough to post your work while learning to read critically and closely and using your growing skills to help fellow writers. This experience has been a tremendous boon to my ability to revise and edit, to see fault in my own writing and know how to fix it. Scribophile is a lively environment of diverse writers from Literary to Limerick, Non-fiction to Fantasy and every genre in-between. Sign-up. You’ve nothing to lose and everything to gain. At last! My novel has entered the Wide World and I am so excited. Can’t wait to have the first copy in hand. You can see it at Friesen Press and order it there, where you’ll get the best price (except for shipping. Outrageous and I’m protesting) unless you prefer electronic books, in which case Amazon has it for download, and Powells has it for other tablets and iPhone/Touch/Pad etc. It will be available as soft cover and hard cover as well within a week or so at Amazon with their more reasonable shipping deals. In the meantime, I’ve uploaded a video to YouTube which is actually just a still picture of the cover and I read the prologue and 1st chapter. To all those who steadfastly asked “When’s your book coming?” I thank you — for being patient with me and my crazy adventure and still showing interest. I would love to hear your thoughts and it always helps when readers take the time to post reviews. I’m on the lookout for local authors. If I’m not sitting in front of this screen writing, I’m reading. 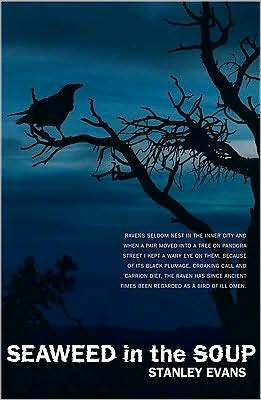 So, it’s time to extend my “Favourite Authors” list to include the creative offerings close to home, Vancouver Island. I’ve just finished “Seaweed in the Soup” by Stanley Evans, a British born Victoria native and found it to be a great detective novel that had enough skillfully written setting and character development to engage this – primarily Literary Fiction – reader into burning the midnight oil. See my review here . I have the first proofs and, with the resourceful help of my Chemainus Writer’s Group, I’ve captured the “comma-kazies” and the “time-line trippers”. The cover looks fabulous and I’m over the moon excited. 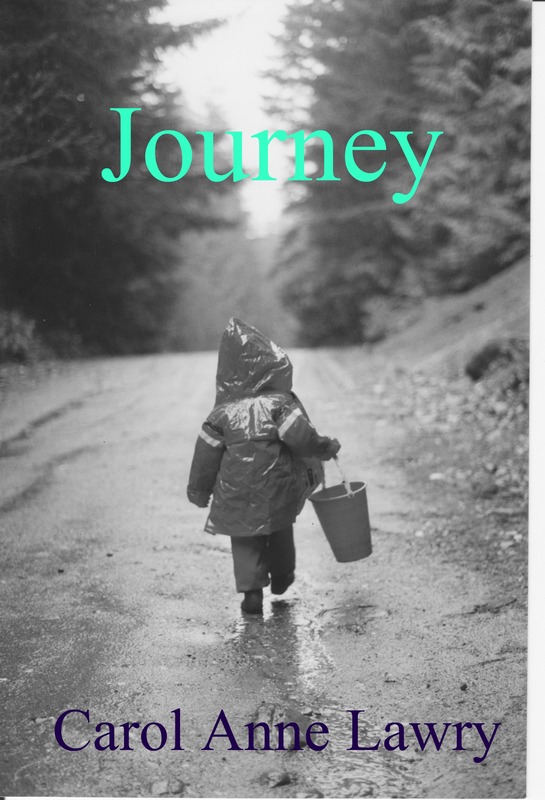 “Journey” will be available at Friesenpress.com and at Barnes and Noble and Amazon. I’ll give all the links when I get notice that I’m up and running. Wishing I was here and winter was still around the corner and down the block. The rain thickened into snow as I drove south this morning. Ugh! I have a strong desire to fill my cheeks with nuts and burrow into a nest of quilts. But there’s still work to be done, final revisions and cover designs.